Cleaning is probably the dullest of all chores. Nobody wants to waste their life doing chores. The same old tasks that have to be done again and again. If I were to rank all the chores by how boring and monotonous they are, cleaning the floor would be at the top of the list. You have to broom or vacuum the floor first, then you have to mop it, and in some cases, you might even have to scrub it! Luckily, we live in the age of convenience, and there are more products than ever these days to make light work of tedious tasks. Hi, I’m Heather, an interior designer and a cleanliness freak, and today I’m presenting a review of the Bissell CrossWave Floor and Carpet Cleaner. So, keep reading to know if it will be the right choice for you! Bissell Crosswave All-in-One Multi Surface Cleaner Reviews 2019: What makes it unique? 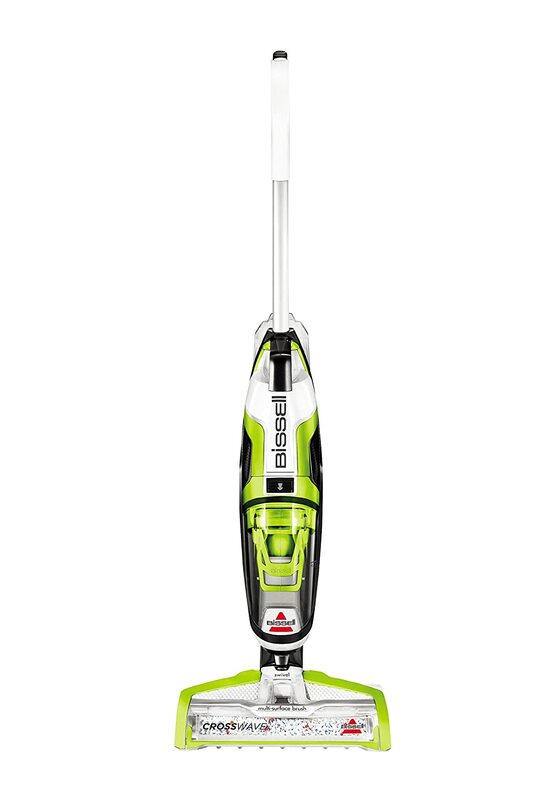 How is the Bissell CrossWave better than a traditional vacuum cleaner? What is the need for a product like the CrossWave? I’ve repeatedly mentioned “cleaning” in this article, and it doesn’t limit to mere vacuuming. No siree, it includes mopping the floor as well to make sure it shines like a diamond. 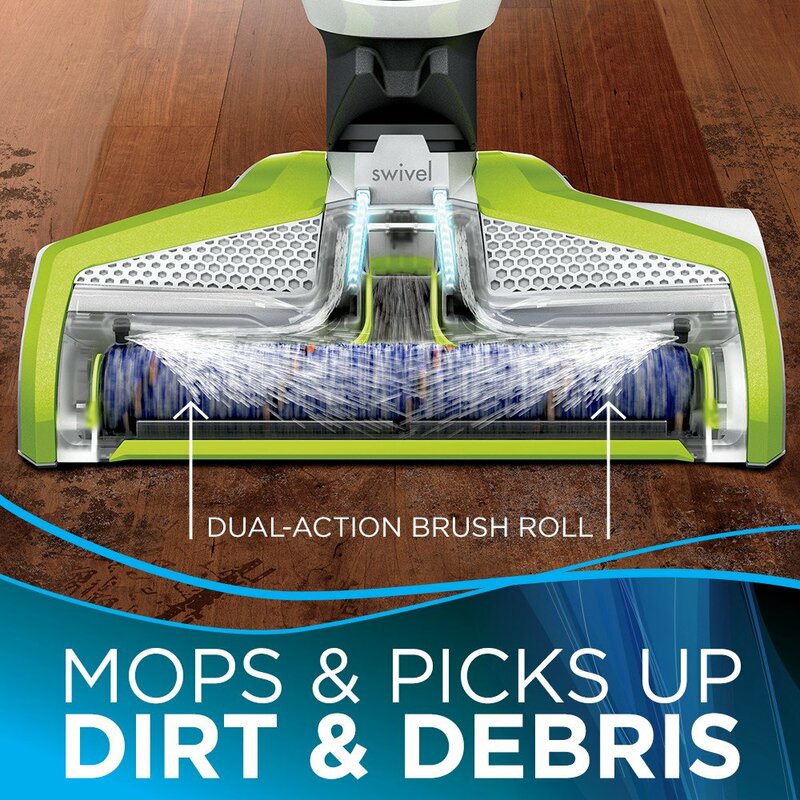 Well, that’s where the Bissell steps in; it cleans AND washes your floor! The CrossWave comes with a variety of add-ons to ensure that it is adequately equipped for every situation. Add-ons include multi-surface formulae, a rug kit, a wood-floor kit, and a pet formula. 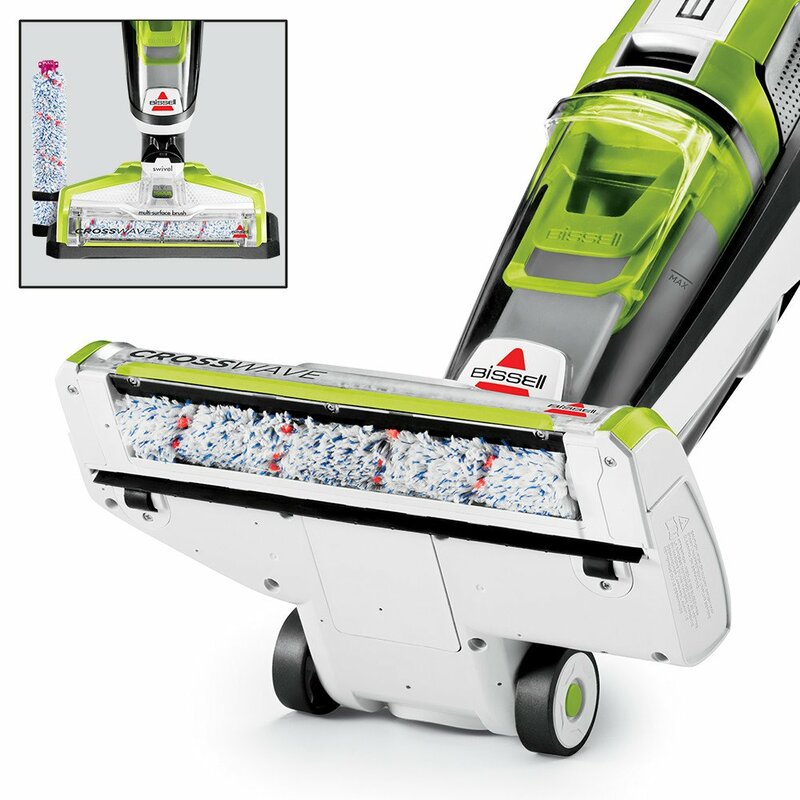 Apart from the add-ons, the CrossWave features a multi-surface made of microfiber and nylon which mops and laps up dirt, dust, and debris at the same time. Moreover, by utilizing two tanks for separating dirty water from clean water, it ensures that the solution is changed whenever needed and the same dirty water isn’t recirculated. The CrossWave, unlike other vanilla vacuums, features innovative touch controls which allow you to specify the surface you’re cleaning as well as the kind of solution you’re using. Think of it as the terrain selector on a 4×4 off-roader. That’s what you would call a smart cleaner! At this point, you may be wondering how is the Bissell better than your neighbor’s Hoover. Is it even better than most of the vacuum cleaners on the market? Well, being “curious” when it comes to vacuum cleaners and having tried most of them myself, you can take my word for it that the CrossWave is better than most. For starters, while most vacuums tend to focus on just one aspect of cleaning i.e. clearing dirt, the CrossWave focuses on wiping and mopping the floor as well which reduces labor, time and cost. It also reduces the need to have a separate mop in your storage, as the rotating brush included in the CrossWave is adequate. Being an interior designer, I often have to judge different kinds of floors against each other. And when I tell clients that one kind of floor is hard to clean, I see their faces drop as they realize they’ll have to choose their heads over their hearts. So, if you’re afraid of getting your dream flooring because it won’t be kind to your back, then the CrossWave is for you! Well, now that I have told you a little about the CrossWave and how it’s better than a traditional cleaner, you might be asking yourself: what is the need for such a device? How is it relevant to me? Where does it fit in in my life? Well, the CrossWave is great if you’re the kind of person who cannot live dirty but hates cleaning at the same time. I am one of those people, which is why cleaning is always an uphill task for me and is rarely enjoyable. The CrossWave also makes sense for people suffering from postural deformities and/or back problems and having trouble bending or getting on all fours. Since the CrossWave’s operation involves standing upright only, there is seldom a need to bend. The CrossWave can also be used for commercial applications. If you run a commercial establishment such as a hotel or a restaurant, you’ll be familiar with the fact that time is money, and time saved is money saved. So, save yourself and your staff some time by avoiding duplication of efforts (vacuuming and mopping) by combining the two activities into one. Apart from increasing efficiency, this product will also boost efficiency as staff will have an easier time cleaning those hard-to-reach spots. Lastly, you will not have to get different products for different applications. As the Bissell CrossWave comes with a variety of add-ons and can be used for a ton of applications such as on different surfaces (wood, tiles, rugs, etc.) and even for cleaning pet fur, you will save money by not spending on more equipment. The Bissell features an innovative microfiber and Nylon brush which spin at a very high speed of 3500 revolutions per minute. Microfiber, as the name suggests, is very fine and is used by professional cleaners to clean sensitive and smooth surfaces. The material is great for trapping even the smallest particles of dust and dirt, implying that not even a speck of dirt will be left on your floor. As mentioned, the CrossWave also mops, and it achieves this by the virtue of two sprayers on either side on top of the brush which spray the solution onto it during the cleaning process. 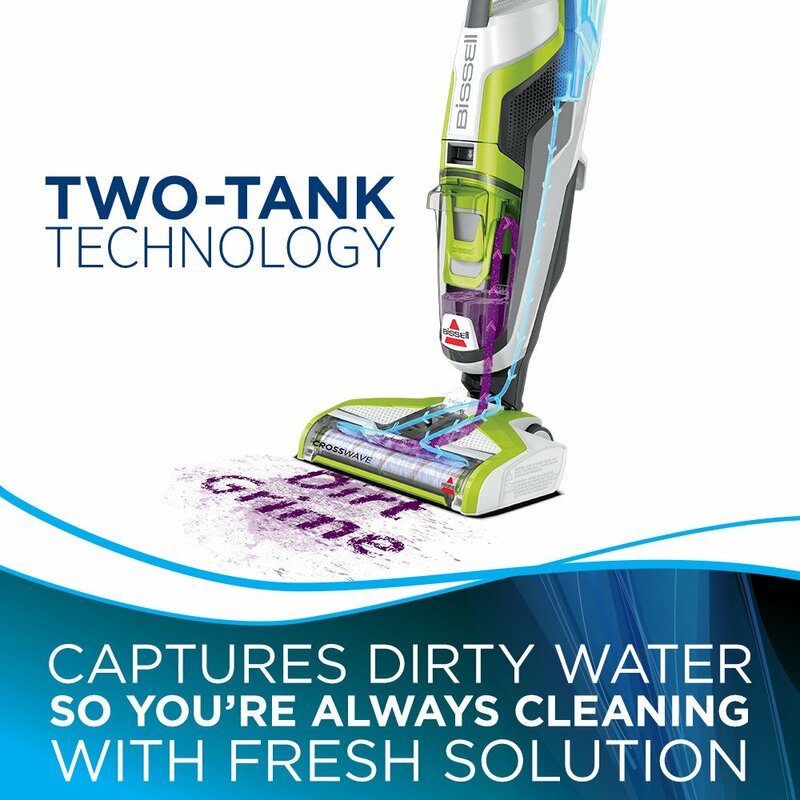 The CrossWave features a dual tank system which ensures that dirty and clean solution don’t mix. The 28 oz water tank has separators in it which prevent the dirty solution from recirculating. If the dirty solution were allowed to recirculate, it would be dumping all the dirt collected by the brush back onto the floor, making the whole cleaning process redundant. While most conventional cleaners feature clunky and archaic analog functions, the CrossWave features a sleek, modern and minimalist control panel (something an interior designer like myself appreciates). It features two soft-touch panels which allow you to switch between rugs and hard floors instantly. Moreover, as the CrossWave can clean a variety of surfaces (more on that in the next point), you can also specify the kind of floor you’re cleaning on for better operation. Now, that’s smart! The CrossWave, despite its features, has its fair share of flaws, and although I found some workarounds for a few of them, not all of them can be avoided or ignored. While wet vacuuming may be the CrossWave’s party piece, for it to qualify as a vacuum cleaner, it should be able to perform the most basic function of a vacuum cleaner i.e. dry vacuuming. Unfortunately, when it comes to dry vacuuming, the CrossWave is merely satisfactory and nothing to write home about. However, this is to be expected, because the CrossWave is a jack of all trades, and a jack of all trades is a master of none. If dry vacuuming is your sole purpose for buying a cleaner, it’s best to go for something else. 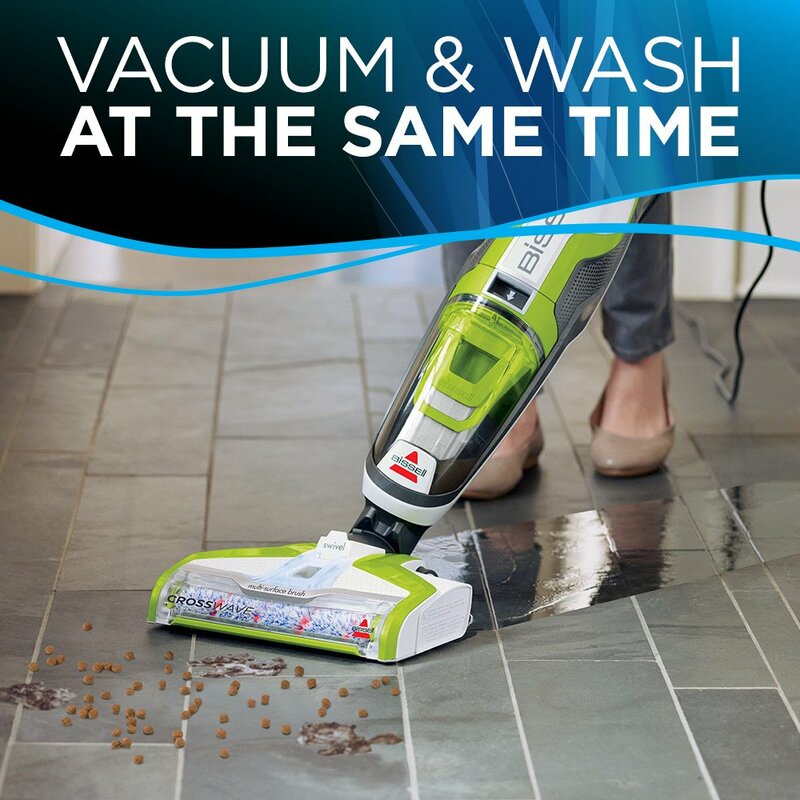 Having said that, the cost-benefit analysis (the cost being the reduced dry vacuuming functionality and the benefit being the added vacuum + mop functionality) is skewed heavily in the CrossWave’s favor, so it still makes sense to buy this over a traditional cleaner. Some users have reported that the product leaves dirty streaks during cleaning. While there is a solution to this (more on that later), I will concede that this is a demerit of this product and Bissell should either provide instructions on how to avoid them or fix the design flaw which allows them to manifest in the first place. I experienced the dirty streaks myself. They look particularly bad, especially if you have flooring which is on the darker side. Those white lines ruin the look and might leave your floor worse off. The streaks are caused due to the rotating action of the brush mixed with using the wrong formula. The solution to this problem is simple but might be a slight hassle to implement. First, make sure you’re using the right solution for your floor. The streaks can be left behind by using, say, the formula meant for tiles on your wooden flooring. If you’re not sure which formula is best for your floor, experiment a little or stick with the multi-surface formula. Next, while vacuuming, make sure you apply a little pressure from the top. Doing this ensures that the brush spreads the solution around evenly instead of just brushing it lightly. Make sure you cover all the area where the solution has been poured. Some users have complained that the bearings on the impeller side of the motor are prone to premature wear and tear and once they fail, they render the machine useless. To complicate matters further, the bearings are not accessible even by a professional, as they are sealed during the manufacturing process. The design of the bearings and their housing, as claimed by some users, allows moisture to enter the bearings and leads to permanent damage. Meaning that the only option left is to replace the bearings, which involves permanently damaging the body of the machine. Well, it’s a good thing you don’t have to worry about that anymore. Bissell is a responsible company, and when they first got word of this problem, they rectified it immediately. So, this issue will probably not affect your experience with the CrossWave. Despite the CrossWave’s excellent build quality, if something should go wrong, you need not to worry thanks to the warranty. The CrossWave comes with a two-year limited warranty. This means that if there’s a problem with your product which has arisen due to a manufacturing or design flaw, then Bissell will take care of it as long as it’s within two years of the date of sale. It must be noted that the warranty does not extend to damage arising from negligence or manhandling of the product. It also does not cover commercial applications and covers only personal use. Regular maintenance such as replacing the filters is the responsibility of the consumer. 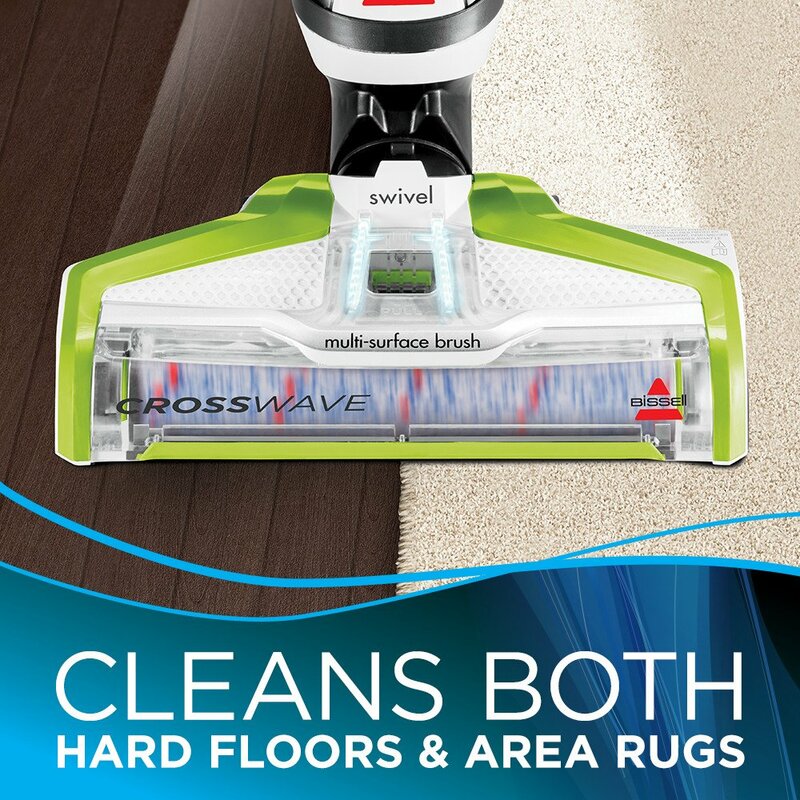 If you’re sick of cleaning your floor after vacuuming it, look no further than the Bissell CrossWave. It is a marvel of technology and innovation and allows you to vacuum and clean your floor at the same time. It has several unique features and with its add-ons, has a ton of applications. Sure, it does have its fair share of flaws, but which product doesn’t? Overall, I’m very happy with mine and I recommend you to check it out as well.